An 11:11 Experiment presents the critically-acclaimed, autobiographical one-woman show – Listen…Can You Hear Me Now? 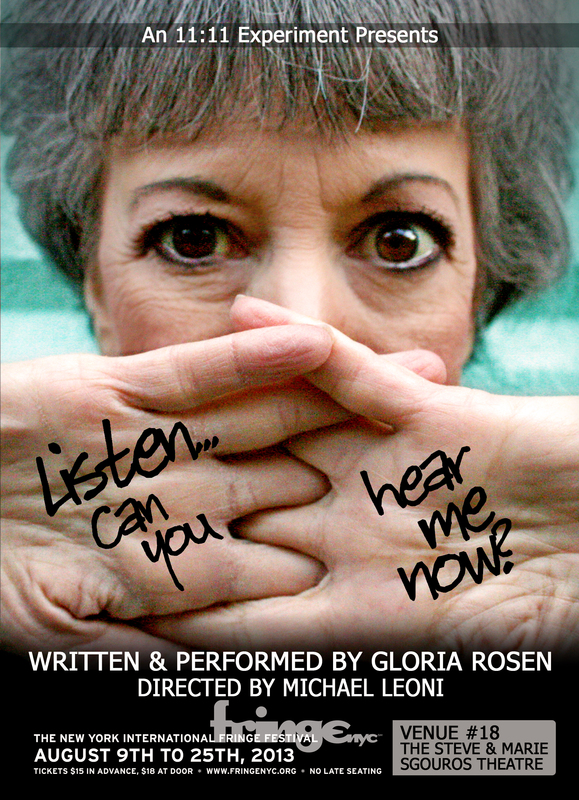 – written and performed by Gloria Rosen at the New York International Fringe Festival. Conceived by Peter Flint, Directed by Michael Leoni and further developed in Matt Hoverman’s Create Your Own Solo Show Workshop, the production is set to run August 10-24 at Venue 18 at the The Steve & Marie Sgouros Theatre. Hearing makes Gloria an outsider in her home where telephones and doorbells set off flashing lights, and she becomes the world’s first lip syncher. Rosen was the vigilant listener – the one to sort out all the sounds, let her parents know what was happening at all times, and be their connection to the hearing world. The sole interpreter for deaf parents shares the daring, funny, eye opening story of finding her own voice. The New York International Fringe Festival (FringeNYC) is the largest multi-arts festival in North America, with more than 200 companies from all over the world performing for 16 days in more than 20 venues. TICKETS: $15.00 in advance and $18 on the day of the performance. Tickets will be available starting July 19th, by Phone (866.468.7619), Online and in person at Fringe Central beginning July 27th.